House Majority Leader Kevin McCarthy (R., Calif.) dropped out of the race for speaker of the House on Thursday just as the Republican conference met to vote for John Boehner’s (R., Ohio) replacement. The GOP leader told lawmakers he was not the right person to lead the conference. McCarthy was expected to win the GOP nomination for the position and embark on a three-week race to the election on Oct. 29, which has now been postponed. He would have had to receive at least 125 votes at the secret ballot meeting Thursday and 218 votes from the full House at the end of the month in order to succeed Boehner. The majority leader’s announcement comes just a day after the House Freedom Caucus notably declined to endorse McCarthy, instead backing competitor Rep. Daniel Webster (R., Fla.). Rep. Jason Chaffetz (R., Utah) is also running for the speakership. Boehner surprised members of Congress when he announced his resignation at the end of September. The Ohio lawmaker, who had served as speaker since 2011, said that he was resigning amid "leadership turmoil." Boehner faced pressure from conservatives to more aggressively pursue their causes. Boehner will leave Congress at the end of October. The outgoing House speaker effectively endorsed McCarthy during his press conference addressing his resignation in September. "I am not going to be here to vote on the next speaker. But that’s up to the next members. 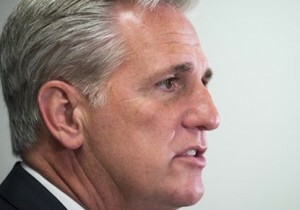 But having said that, I think that Kevin McCarthy would make an excellent speaker," Boehner said. Boehner said Thursday that the speaker election has been postponed.